Michigan Federal Criminal Defense Lawyers - Oberheiden, P.C. 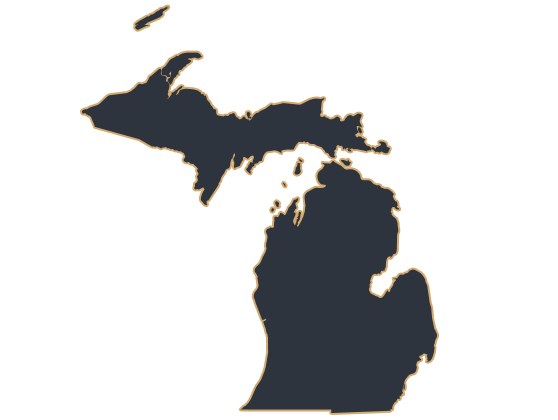 Oberheiden, P.C.’s accomplished Michigan federal criminal defense lawyers have represented clients all over the U.S. including the United States District Court for the Eastern District of Michigan (in case citations, E.D. Mich.), as well as the United States District Court for the Western District of Michigan (in case citations, W.D. Mich.). Do not delay in contacting us if you have been approached by federal agents, from the FBI, IRS, DEA, or OIG, or if you have received a target letter or grand jury subpoena. Our record of success can help you avoid federal charges. The Great Lake State is only one of the many states our attorneys have represented criminal defendants in trials or investigations. Our team has amassed decades of valuable experience and many of our Michigan federal criminal defense lawyersare former federal prosecutors who understand the steps necessary to help you avoid incarceration or paying colossal fees. We are available to represent clients in the United States District Court for the Eastern and Western District of Michigan. Our Michigan federal criminal defense lawyers never waver in their resolve to obtain the result you desire and will utilize various legal strategies to achieve this. Even though negotiating can be an effective tool and a worthwhile approach, Oberheiden, P.C.’s legal team has had tremendous success in simply convincing federal authorities to drop charges entirely, even after federal indictments have been issued. United States v. Client: Federal Indictment Dismissed. United States v. Client: Grand Jury Declined to Indict Our Client. United States v. Client: Government Did not Prosecute Our Client Despite Admission of Guilt. United States v. Client: Prosecution Declined to Continue After We Appeared in the Case. A lot of people assume that the indictment is the first step in the process, but this is actually not entirely true. Before an indictment is issued, there are several other steps, including: the investigation, search warrants, administrative subpoenas, pre-charge resolution, and intervention. However – let us begin with indictments. These are a tool used by the federal government as a formal means to issue charges in federal criminal cases. The U.S. Attorney’s Office has probably successfully presented evidence to a grand jury who has found “probable cause,” to implicate you or your business in a federal crime, if an indictment has been issued. Did the federal government follow proper procedures before, during, and after the issuing of warrants and subpoenas? How did the federal authorities request this information? Who else, if anyone, are the federal authorities targeting in this investigation? Are there specific reasons the government launched an investigation? Which, if any, information was provided to the federal government? Once your defense team gathers this worthwhile information, it can begin to piece together an effective pre-trial strategy, which can and should happen rather quickly. An indictment or arrest does not necessarily signal that you are headed to court. An experienced lawyer will utilize the lengthy pre-trial process and challenge the government’s case by using legal defense strategies such as poking holes in the prosecution’s case and raising various other legal and factual arguments. Your attorneys could gain a pre-trial release, reduced charges, or reduced sentencing (or dropping charges entirely), by successfully negotiating with the Assistant United States Attorney (AUSA) in charge of your case or investigation. It all starts with successful communication and experience in negotiation. In addition to negotiations with the government officials such as the U.S. Attorney’s Office – your defense team should be utilizing several other legal methods including filing and responding to motions, attending pre-trial hearings, and taking a part in a multitude of other formal legal procedures. These actions are important because they can lead to your charges being dropped entirely, or even crucial evidence being excluded from trial, which significantly improves your odds for a beneficial result. Pre-trial litigation often results in leverage, which is an essential component in plea deal negotiations. Even if your case goes to trial – experienced Michigan federal criminal defense lawyers, such as the ones Oberheiden, P.C. employs, understand that there is still a good possibility of reaching a favorable plea deal or discovering evidence that warrants the termination of the proceedings before the verdict. Your defense team reserves the right to challenge the outcome of the trial on appeals, even if a guilty verdict is handed down against you or your business. Oberheiden, P.C.’s attorneys will proactively represent you at trial and prepare all segments of your case if your court date is approaching and your case is still pending. They can achieve this in numerous ways, not limited to: cross-examining the government’s witnesses, questioning the government’s evidence, and presenting various legal defenses, before a verdict can be rendered. Learn more: What Are My Options after Being Federally Indicted? Our law firm has the philosophy that only experienced and trial-proven counsel should represent our clients in federal litigation matters. This is one of the reasons Oberheiden, P.C. does not employ junior attorneys or legal assistants. The stakes are too high at the federal level. Putting the Government’s evidence in dispute – Did the government follow adequate procedure – for example, is the evidence that was gathered allowed and admissible in court, or was it collected as the “fruit of the poisonous tree,” or hearsay? The government has the task of proving your alleged built beyond a reasonable doubt. Our Michigan federal criminal defense lawyers will question the strength and admissibility of the government’s evidence and overall case at every turn. Asserting Affirmative Defenses – Your attorneys can utilize a legal strategy called an affirmative defense. This strategy focuses on not disputing that certain acts were committed, but instead showcasing that these same acts cannot constitute a crime under the circumstances involved. Challenging the Sufficiency of the Government’s Case – Your Michigan federal criminal defense attorneys should ask important questions such as if the prosecution can prove beyond a reasonable doubt that you are guilty of the crimes alleged against you and if the U.S. Attorney’s Office can showcase that all elements of the federal crime in question are present? If not, it may not be enough to secure a conviction. Asserting Constitutional Violations – Constitutional violations might be another avenue to weaken the government’s case against you or your business. Perhaps your Miranda rights were not read to you, or read to you too late, or you were stopped with no reasonable suspicion? These are only some examples of arguments that could be raised on Constitutional grounds. Michigan is divided into different federal districts. The Wolverine State is part of the United States Court of Appeals for the Sixth Circuit (in case citations, 6th Cir.). In the United States District Court for the District of Michigan, federal prosecutors are tasked to enforce federal law on behalf of the U.S. Department of Justice. Michigan is divided into two federal districts, the Eastern District and the Western District. These districts locate federal courthouses as well as branches of the Department of Justice, so-called U.S. Attorney’s Offices. The U.S. Attorney’s Offices in Detroit and elsewhere employ federal prosecutors, also referred to as Assistant United States Attorneys (AUSA). The United States District Court for the Eastern District of Michigan covers the counties of Alcona, Alpena, Arenac, Bay, Cheboygan, Clare, Crawford, Gladwin, Gratiot, Huron, Iosco, Isabella, Midland, Montmorency, Ogemaw, Oscoda, Otsego, Presque Isle, Roscommon, Saginaw, Tuscola, Genesee, Jackson, Lapeer, Lenawee, Livingston, Macomb, Monroe, Oakland, Saint Clair, Sanilac, Shiawassee, Washtenaw, and Wayne, and it hosts federal courthouses and U.S. Attorney’s Offices in Detroit (231 W. Lafayette Blvd., Detroit, MI 48226), Ann Arbor (200 E. Liberty Street, Ann Arbor, MI 48104), Bay City (1000 Washington Ave., Bay City, MI 48708), Flint (600 Church Street, Flint, MI 48502), and Port Huron (526 Water Street, Port Huron, MI 48060). The United States District Court for the Western District of Michigan covers the counties of Alger, Baraga, Chippewa, Delta, Dickinson, Gogebic, Houghton, Iron, Keweenaw, Luce, Mackinac, Marquette, Menominee, Ontonagon, Schoolcraft, Allegan, Antrim, Barry, Benzie, Berrien, Branch, Calhoun, Cass, Charlevoix, Clinton, Eaton, Emmet, Grand Traverse, Hillsdale, Ingham, Ionia, Kalamazoo, Kalkaska, Kent, Lake, Leelanau, Manistee, Mason, Mecosta, Missaukee, Montcalm, Muskegon, Newaygo, Oceana, Osceola, Ottawa, Saint Joseph, Van Buren, and Wexford, and it hosts federal courthouses and U.S. Attorney’s Offices in Grand Rapids (110 Michigan St NW, Grand Rapids MI 49503), Lansing (113 Federal Bldg, 315 W Allegan St, Lansing MI 48933), Kalamazoo (107 Federal Bldg, 410 W Michigan Ave, Kalamazoo MI 49007), and Marquette (202 W Washington St, PO Box 698, Marquette MI 49855). Our law firm has spent many years crafting a renowned reputation for federal litigation defense. Led by the founding attorney, Dr. Nick Oberheiden, our law firm carries an impressive record of federal litigation experience, and employs seasoned attorneys, many of whom were former state and federal prosecutors. If you call today, we will provide you with a confidential and free case assessment in order to determine if our firm is a good fit for your case. Our Michigan federal criminal defense attorneys are solely focused on federal litigation, and will take the time to develop a defense strategy that is capable of helping you avoid charges and incarceration or loss of business. It starts with a free consultation, so do not delay. Schedule Your Free and Confidential Case Assessment at Oberheiden, P.C. Call us at (888) 519-4897, or tell us how to reach you online now if you are facing federal charges in Michigan. Our Michigan federal criminal defense attorneys are standing by 24/7, and we will work hard to help you regain your freedom, license, and way of life.